Sushi is about the rice, not the fish. This is why a California roll, which contains no fish, is still sushi, but sashimi, which is just a slice of raw fish, is not. So while most people immediately associate the word “sushi” with raw fish, it is actually named for the rice which accompanies it. Bonsai is another one of those Asian words with perhaps the wrong instictive meaning. I say “bonsai” and you think “highly trained small trees” but bonsai is really named from the shallow pot in which the trees grow. Without the pot, it isn’t bonsai. I really dig bonsai, I don’t own any bonsai, but I love looking at them. I suppose there are many reasons to grow bonsai, but it seems mostly the desire is to make the trees look older, and have more character. Old, twisted, gnarled trunks, or straight trees that droop stately with age. 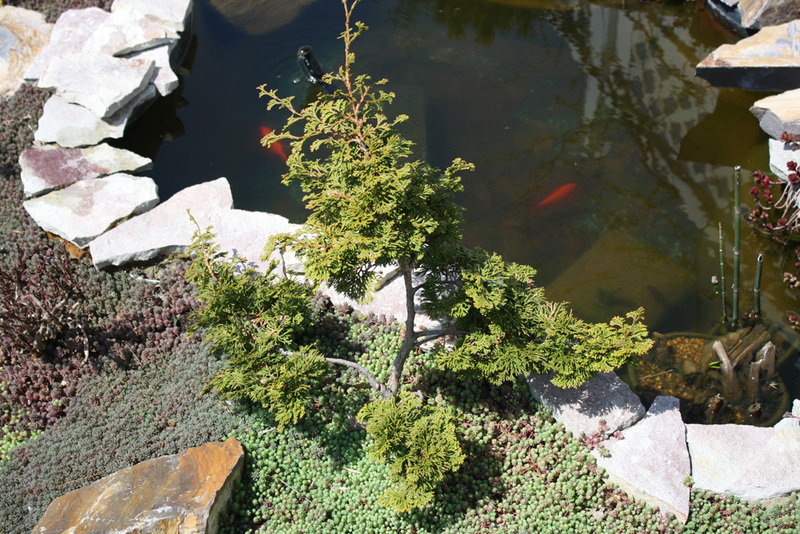 Character isn’t found in young trees and so bonsai training techniques are generally used to make trees older. It is a misconception that a bonsai artist wants his tree to grow slowly, he actually wants it to grow faster so it can react to his training faster, he’ll keep it small by pruning, but wants that trunk to keep getting wider. With bonsai you’ll prune the leaves and branches, and use wires to guide the plant to grow as you like, but you’ll also lift it out of it’s pot and prune the roots to keep them smaller as well. Hence the necessity for a pot. 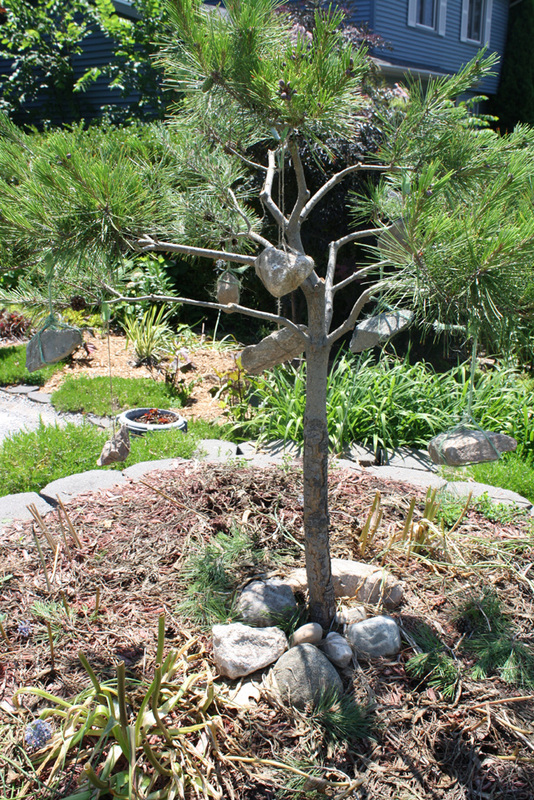 You can’t root prune if you plant in the ground, and if you plant in the ground it isn’t bonsai. But what is it? Well, it is Niwaki (alternately spelled Niwagi or Niwa-ki or Niwa-gi). If you’ve ever been to a really nice Japanese garden you may have noticed trees planted in the ground yet obviously trained to look older or with more character as in bonsai. This is niwaki. Same rough practice, different sized plant. I don’t own any bonsai, I really can’t. In Michigan, the pots wouldn’t do well outdoors, and I don’t have any indoor space with enough light for a bonsai (no south facing windows in my house). I can, however, do niwaki, because I really like old looking trees. So, I’m trying to do it. 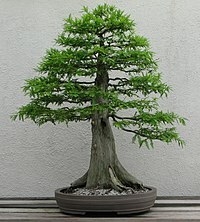 A few years ago I bought a bald cypress because I really like the formal upright bonsai form of bald cypress, where you basically make it look like a giant 500 year old tree. I haven’t done anything with it yet, because I also just like big bald cypresses. I do however have two other trees I planned to work with, and I finished both today. 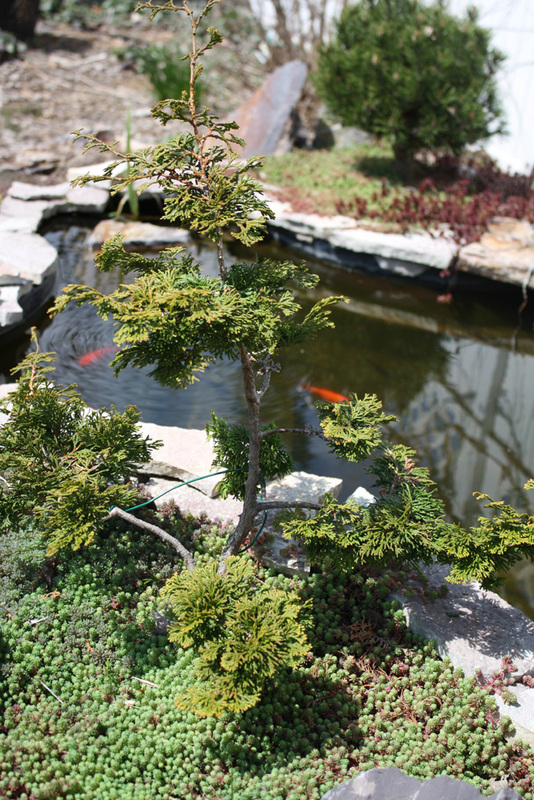 The first is a dwarf hinoki cypress planted near my water feature. Hinoki cypresses are very similar to our native arborvitaes but their leaves twist outward a little more creating, what I think is anyways, a more interesting texture. This plant is a dwarf, which I chose because I will be unable to do actual root pruning (as I could with a bonsai) and it is a very small space. I had done some pruning and training on this plant previously, but I really went at it now. So, if you desire a plant to look older, what do you do? Well, on a new, young tree branches tend to reach upward, whereas on a very old tree the weight of them has pulled them more parallel to the ground, or even angling towards the ground. So trying to train branches to grow straight out from the trunk, or slightly downwards, can give an illusion of age. The other thing you look for is separation between sections of a tree, especially on conifers. There should be a gap, an emptiness, between where foliage on one branch ends, and where foliage on the next highest branch begins. This gap is a characteristic of really old trees (that have lost branches from natural attrition) and creating it on your smaller, younger trees, will give them character. The other thing you can do is, since we don’t pick in what direction branches extend out from the trunk, use wires to point them in the direction you wish to grow, to make sure the tree branches evenly, or unevenly, if that is what you are going for. I created separation by removing foliage and branches where necessary, I exposed more of the trunk (another thing that makes a tree look older), and I used some wires to bend branches in interesting directions, or to where there is a gap I felt needed filling. When using wires do NOT leave them on longer than 1 season, or the tree can be strangled by them. As I show in a picture in this post on tree staking a wire left in too long is a very bad thing. The other tree I did was my tanyosho pine I had planted it in 2007 and it had really grown well last year, and put on huge new candles this year. The trunk was also finally starting to get a crinkle texture. But I had always planned to train it in an interesting way. Still, I was nervous. This tree was nice, and was right in front of my house, front and center, the middle of my front yard, raised on a raised bed pedestal even. When you prune a limb off, you can’t hit the undo button. I had been putting off the moment for weeks, thinking “Do I really want to do this?” Finally, today, I did it. No going back now. As with the hinoki cypress I wanted to emphasize the branching structure by opening up the middle, I wanted to angle the branches more downwards, and I wanted to create separation between the foliage sections. However, with this pine, there was another issue. 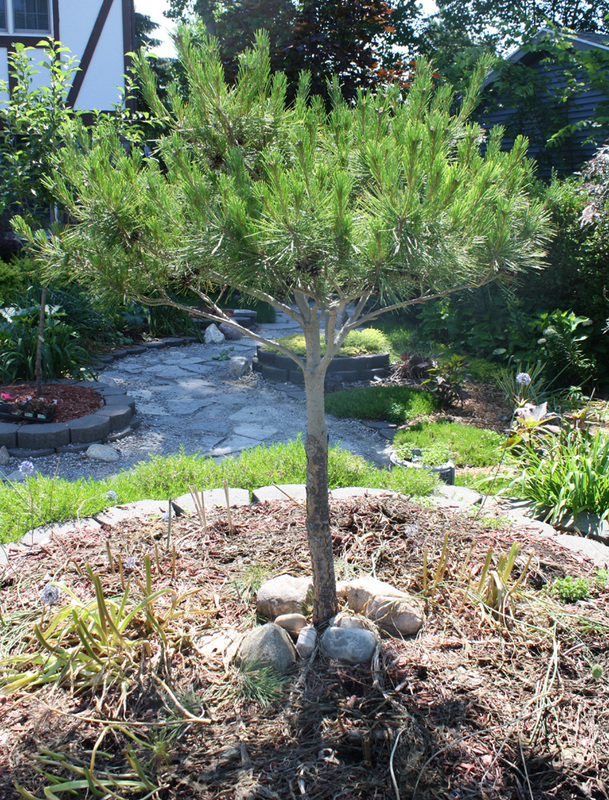 Tanyosho pines are also called umbrella pines because they have an upswept growth habit, a flat-top if you will. Had I let it continue to grow, it would have that flat top. So the natural growth habit is interesting. But, I had seen some pictures of some interesting shapes you could achieve with it in the Niwaki book I had gotten for Christmas. Basically by pulling the branches downward so that they now left the trunk at a 90 degree angle, I could get a really neat look because the growth would still go upswept at the ends of the branches, it would basically take on the look of a very old pine tree. To achieve this, because this tree was much bigger, I had to use a niwaki technique of weighting branches with rocks. This also made me nervous. Too light of a rock and the branch wouldn’t move enough, too heavy, and it could snap. Also, I had to think about wind, rain, and snow, all of which can increase the load on the branches. I hope I did it right. I should only have to leave the rocks on through the growing season this year, and the branches should conform to their new shapes (I hope). I will definitely take them off before winter hits, both for snow and because the cold will make the tree more brittle. I also pruned all the downward secondary branches that were growing. They wouldn’t actually grow downward, but they would start on the bottom of the branch, and then curl up around it (with the upswept growth habit). It gave the tree a much cleaner look without them. All told, I removed a lot of material from this tree, but there is no going back now, I hope I don’t regret it. I basically picked one branch I wanted for each direction, and pruned off ones that were doubled up (pruned off the weaker branch of the two that were growing due west, for instance). I also thinned it out in general towards the middle, leaving tufts of needles at the ends of the branches. Trunks, to me, can be as interesting as leaves. So by opening up the inside I hope to show off the branching pattern of the tree. I’ll post updates as the years pass (until I move anyways) to show the progress of this tree, and how it is growing with my training attempts. If it continues to grow as vigorously as it did this Spring, it shouldn’t take too long for it to adapt to the new form. A note on using the rocks. 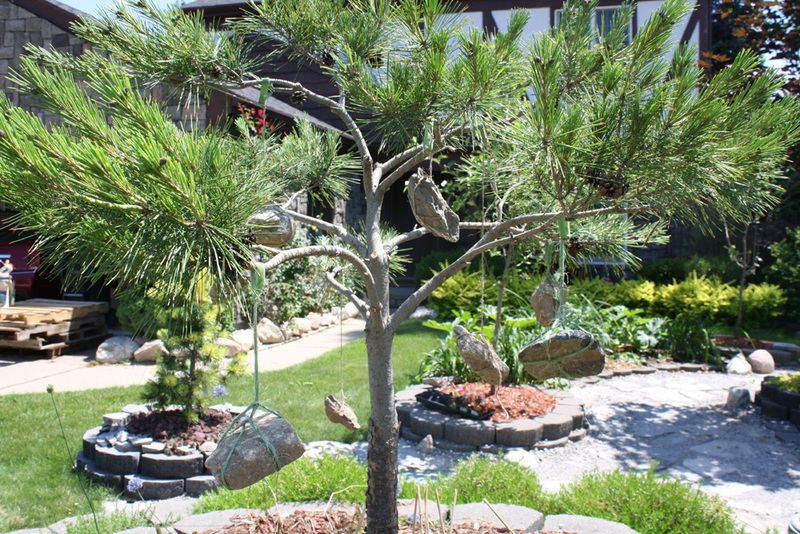 Don’t tie the rocks directly to the branches, the ropes can cut into them. I first looped wider (about half an inch) velcro plant ties around the branches, then tied the rocks to the plant ties (using twine). Great post! I’ve been wanting to do this ever since I went to Japan and saw the gorgeously shaped trees in all their gardens. What courage! We’ve got 2 tanyosho pines. One is at least 6 feet across. The other is only 4 across as one side was stunted by a nearby bush. If we really give up on it filling back out, this could be a last ditch effort for us to save it. Compliments on your pruning skills, the pictures really are great. Oh and I particularly like how you break down the visual difference between the branches of the old and younger trees. It’s not something I noticed before (possibly because I mainly grow garden herbs) but be sure that I will look out for this in the future. I really like your water feature and the coy fish you have. Hopefully next summer I can get mine in! Thanks for another great post.